I really love pumpkins and when the Halloween season comes along I squeak like an over excited toddler when ever I see a pumpkin patch. Each year I have been here (did I mention it is 5 now!) I have insisted on carving pumpkins. When we were little no one celebrated Halloween in the UK - in fact if someone did ring your doorbell you didn't answer it for fear of having eggs thrown at you or something horrible like that. So the discovery of dressing up, stupid amounts of candy, tacky decorations (our front lawn was so nearly decorated in polystyrene tombstones last year - until I realized ... at the check out ... tombstones in hand ... that it might lead to divorce) and of course - pumpkins!! Last year I made some life sized patchwork pumpkins. They were very luxurious and really quite beautiful. 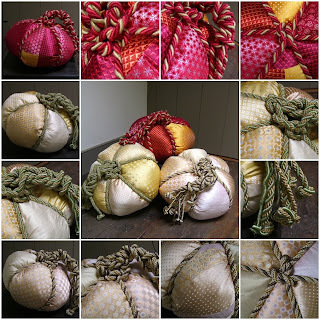 I used recycled silk ties and lovely thick upholstery cord to tie around the pumpkins. However lovely they were - and they were certainly big - they deemed to be totally impractical for selling on Etsy due to postage costs! 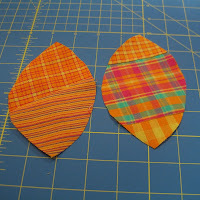 Here is my tutorial for making your own simple patchwork pumpkin. My version this year is much smaller - but the tutorial will help you make any sized pumpkin - it is up to you. Remember that pumpkins come in all shapes and sizes - so if you think your sewing is too dodgy or your stuffing is too lumpy - it won't matter in the least - throw caution to the wind and dive on in!! 1. Make your template. 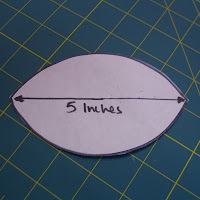 Your template can be any size - as long as it is this sort of eye shape - it will work. 2. 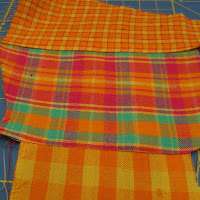 Cut out the template out 6 times from different fabrics. 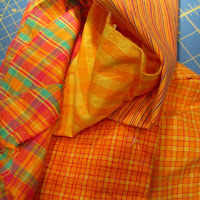 This is a great way to use up all those small pieces of fabric you have lying around - sew pieces together to make patchwork strips ... ... and then cut out the templates. Each section of the pumpkin can be as plain or as 'patchworked' as you like. 3. 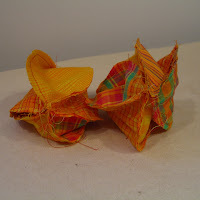 Sew the shapes - one by one - together to make a ball. Remember you need 6 pieces sewn together make a pumpkin. 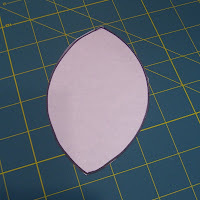 Leave part of the last seam open - this will allow you to turn the pumpkin right side out. Turn your pumpkin right side out and stuff. Sew shut the open seam. 4. 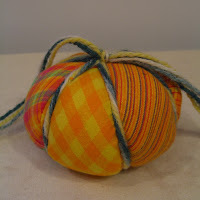 Now you need to cut your yarn/thread that will wrap around the pumpkin. You will need 12 x the length of your template. My template here was 5 inches long so I cut 60" of mixed yarns. I chose to use 4 strands of yarn - a dark green, light green, yellow and a cream. There are so many things you could use to add decorative detail here - ribbons, sequins, lace etc - just experiment! 5. 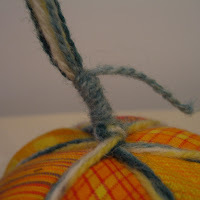 Tie your yarns around your pumpkin (I twisted my yarns together as I went.) 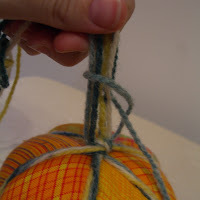 Make sure the yarn is tightly squeezing the ball - this will help give the 'pumpkin' shape. 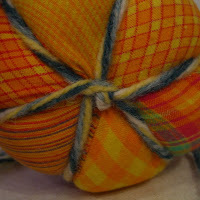 You will find that knotting the yarn at each 'junction' will help it stay in place. Make sure you make a nice strong knot at the top of the pumpkin. 6. Once you have tied the yarn around your pumpkin - you will want to make a stalk. Select one strand of yarn and use it to wrap around the other strands. I used a simple slip knot which I repeated (keeping it nice and tight) until I didn't have any yarn left and a little stalk was left at the top of the pumpkin. Tie a knot at each end of each yarn strand and trim to your desired length. You can add a little leaf to your pumpkin if you wish. I cut a pumpkin leaf from green felt and tied the leaf to the stalk of the pumpkin. So what to do with my little pumpkins. 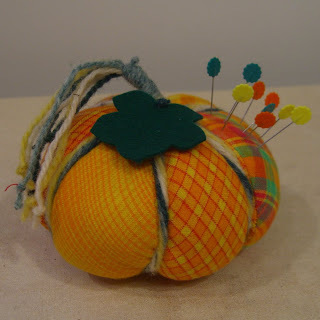 Well this little pumpkin is just the perfect size for a pincushion ... ... and if you would like to win this little pumpkin pincushion - all you have to do is leave a comment on my blog (remember to leave an e-mail address so I can find you) before midnight (EST) on October 23rd! UPDATE: Pumpkin was won by Donna from Cottage Days & Journeys. Number was selected by the Truly Random Number Generator! Oh that is so adorable! I would love to win it please! Email address is on my blog page! Dash it - I thought I was first!! As I'm always throwing my pins around this would come in really handy!! Such an easy tutorial to follow, so I think if I don't win your giveaway I'll make my own!! I love the pumpkin and the tutorial is well done, I want to make a little pumpkin patch of my own this weekend. I would love to win of course. Thanks for the chance. Thanks so much for posting the how-to's! I can't wait to make these! What a fabulous tutorial! The pincushion looks so cute. Love the life sized ones you made - using silk ties was most inspired! it's so pretty. i need to get a sewing machine. :D i like it! I hope to make some soon. Oh, this is great! I have always wanted to make some pumpkins. Thanks for the tutorial. OMGosh how cute! I will have to try this. Thanks. Love the little pumpkin! I'm going to try to make one also. great tutorial, pumpkins are such lovely things! Please add my name to your pot. I love the little pumpkins, just wish I could sew!! I am going to make some little knitted pumpkins for hallowe'en :oP My e-mail is hetty24tigger@yahoo.com for the giveawat. many thanks! What a lovely idea! I might have to try making these as gifts. Oh lovely, (I am rubbish at working out patterns, how clever of you). I might try this, I could do with a new pincushion and I need to get sewing again...your big ones from last year are simply lovely. Thanks for sharing your tutorial with all of us. I love that pumpkin PC! Please enter my name in the contest. The pumpkins are so very cute. I'm going to try this...when I get some 'free' time. Thanks for sharing your pattern. In the meantime, I'd LURVE to be entered in your draw. Rachael I can't wait to have a go at these thanks for the tutorial!!! Sew good you're able to sew again. Love the pumpkins. What a great tutorial! Please enter me in your generous giveaway too! You can post a comment on my blog to get in touch with me. That is so awesome! I wish I was that good! Thanks for the contest! I'd love to win the pumpkin! That is so cute. Enter me too! Wow, loved the directions. You are really talented. What a sweet little pumpkin; I'd love to win it. I have that same pumpkin in a large pattern. I bought it at a yard sale several years ago. I would love this one to go with my sewing things. Thanks for the give away. Nice pincushion. You are so creative. I would love to win it. So very cute! Love to win! well..... if that isn't the cutest little pumpkin ever!! I want one!!! 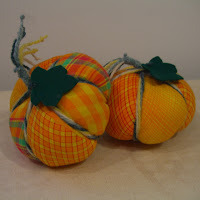 What a great idea to use old ties as the fabric for your wonderful pumpkins. Your tutorial is just great---thank you. So, you're back in NY now? I hope you're settled and it seems you're back to creating! I hope you have a chance to enjoy some lovely East Coast fall scenery, too!! Lovely pattern Rachael, thank you. I hope you are all settled in your new place, I guess one good thing is that they will have some amazing fabric and yarn stores in New York, you will make us all green with envy! What an adorable pincushion. Love it! What a good idea to use silk ties. Thank you for having this! I would love to win this. Fantastic giveaway! THank you! I love your adorable Pumpkin! So so cute! Your really have a gift! I love your pincushions expecially the ones in the red and pinks! Hope I win one!! Count me in...I love them! Thanks for the tutorial - I love the pincushions! You've created a precious pincushion pumpkin! Absolutely fabulous. What a great way to use up some smaller pieces of fabric and come out with something useful as well. I'd love to win this cute pincushion. Your pumpkins are adorable!! If the contest is on for other countries please count me in! That's so cute - I'm thrilled to have a pattern and tute to go along with the inpiration pics. Hi Racheal thanks for your comment on my "new" sewing room it doesnt bother my hubby he has a room out back with his computer in it & hes not much of a tele watcher as for the footy its me that watches it not him hes not sports minded at all!! Im the one that sits up late at night to watch the rugby!! could you please include me in your draw I love pumpkin!! Good job, and great pumpkin! I love the fabrics you mixed. Ooooh, that pumpkin would look so cute by my sewing machine! I have been making a 'theme' pincushion for every month this year and now I have a 'Great Pumpkin' pattern! Thank you for your wonderful inspiration! I would love to win that!! I know I could make one but I have other WIP's going on right now! Cuuuute! I'm going to make these with my daughter! Oh this is so cute. I'll have to make some with my daughter. These are adorable! Love the fabric! Love the little pumpkin! Your blog is beautiful. So adorable! My favorite season is fall (and it is just too short in my area of the world)! Thanks for the chance to win and the generous tutorial! They are simply gorgeous. I'm a big Halloween/pumpkin fan as well. I would love to have that pumpkin. I made crocheted pumpkin this year. Very cute, cant wait to try it. How very adorable! I would love to be entered to win. Thanks! wow, 84 comments already... I so need a pincushion, at the minute all my pins are stuck on the inside lid of my 20 yr old sewing basket :-o... I love the way the USA dresses everything up for Halloween, I wanted to put up some Halloween decs but was told in no uncertain terms I can't do it until it's actually Halloween!!! wanted to let you know i featured this tutorial over at craftandfound.com! The design is very attractive but I have found polyfill is not a very good filling for pincushions. It seems to attract moisture and rust needles if they are left for more than a few days. Bran is sometimes suggested but I usually use wool fleece. Probably wool yarn scraps would work as well, but not acrylic. These are so cute! I'll be linking to this project. Thanks for posting this! Looks wonderful, I'll try it! This is adorable! I need a pincushion. So cute! I'm going to try to make these with my girls. Love, love, love, fall and pumpkins! This is adorable and the tutorial is great! So cute - count me in please. WHAT A GREAT IDEA THANKS FOR SHARE!!! What a lovely concept, and finished product! I could use a pincushion, too. ty for the easy tutorial! Adorable! I need to try to make that. Hopefully mine will be as cute as yours! Thank you for the tutorial as well! Your pumpkins are so cute. I downloaded a pumpkin pattern from somewhere...I can't remember, but I haven't had the chance to make it yet. Maybe if I win one I won't have to...heh, heh. That is just the most adorable little thing! Thank you so much for the tutorial- I will have to make these for my kids teachers for Christmas. These are so beautiful! I'd have this on display next to my sewing machine, they're way too cute to hide away in a drawer. OOoo, I love Halloween too and also get very excited! Your pincushion is lovely adn I would love to win it. If not I will have to try and make one myself!! Cutest thing I have seen in a long time! Love it! I'm totally incompetent with a sewing machine--so the only way I will ever have one of these cute little pumpkins is to win one. OMGosh! Too cute. I am going to have to make one of these for my mother-in-law who loves to sew. Thanks! So cute. . . and thanks for the do-it-yourself instructions! These are darling. I may have to try making these with some fabric I have around here. Really cute, I might just try it. I just bought a new sewing machine and really need a pincushion. Very cute! I would love to win this. You have such a talent and this is really creative! Autumn is absolutely my favorite season and this would be a wonderful thing to have! That is so cute! I love your tutorial; you make it sound so easy to make. But you know mine wouldn't turn out like yours, right? The pumpkins are clever and cool. Hi. I am just beginning sewing and knitting and I just adore you and your projects. I have used some off your instructions to make somethings. Thank you for all that you've helped me with. I would love to have this great patchwork pumpkin,(I would think of it as your autograph. I used a few of your patterns to make toys for the kids in the hospital that is near me. They are very glad. My email is priyanka.04@hotmail.com.Thanks again, for everything. Too cute! Thanks for the contest! That's a great idea. It makes a really cute pincushion. Thanks for having the contest! Great tutorial! Thank you for the opportunity to participate in this giveaway! I posted a link to it on my blog. Feltro-Aholic. very good cool style thank you.